Fifty years ago, on 25th June, 1968, Tony Hancock died in Bellevue Hill, a Sydney suburb. He was only 44. He’d had a glittering career that slowly and inexorably declined, as he discarded his fellow artists and writers. Thereafter, it was all downhill. Towards the end, he went to Australia, to work on television. As we think we remember, he never came back – but he did. ‘Tony Hancock,’ replied Willie, producing this awful plastic urn. Eric Idle and I had been approached to write a series for him on his return from Australia – one of the great if-onlys. What was going on in Tony’s head? He was such a difficult character to nail down, but I have some reminiscences that might give an idea. Come Dancing – the precursor of Strictly – was orthodox ballroom dancing with full evening dress. Frost asked Tony back the following night – we did three shows a week – and they showed Tony a clip of Come Dancing. He laughed all the way through. It was a joy to watch – and a rare TV moment. We were all much more used to the sad expression Tony presented to the world in 1960 on the brilliant programme Face to Face with John Freeman – where, once again, he was his melancholy self. It was the complete cliché: Tony was the broken-hearted clown. His career, too, was an absolute cliché. It’s like John Osborne had written it: up, up and down. Tony was a very interesting man to meet when you talked about life. But it was always the dark side of life he’d get on to very quickly. He darkened the room when he came into it. He was the classic depressive. The late Ray Galton and Alan Simpson, the writers of Hancock’s Half Hour, said Tony was never the same after that Face to Face interview. At one point, Freeman said Tony was as big as you could possibly be in this country – but had he ever thought about films, and becoming known in other countries? Tony got worried, too, when he began to think he and Sid were considered some sort of double act on Hancock’s Half Hour. It wasn’t malice towards Sid when he dropped him; they got on well. But Tony thought, ‘I have got to see if I can do it on my own. I have got to prove myself. Is it just these brilliant scripts? Am I not really that funny without them?’ So he got rid of the writers to find out. When other writers wrote for Tony, it was never the same. He and Ray and Alan – that was a marriage made in heaven. Their scripts were quintessential Hancock and nobody else, however good (and there were some good writers who tried it), could do it. It never worked the same and Tony knew it. Tony was losing his excuses. He then said, ‘My memory is gone. I can’t learn it this week.’ So they gave Tony cue cards with his lines written on. If you watch The Blood Donor, Tony is gazing thoughtfully into the distance as he speaks, every so often looking at the cue cards. From then on, he never learned a script; he always insisted on cue cards. The public began to notice, too. Tony once told me he got in a taxi a few days after a lacklustre performance and the taxi driver, 'I saw you doing that rubbish on Sunday night. '‘I am not mad about the way that you’re driving this taxi,’ Tony said. But we mustn’t forget that Tony was a brilliant comic actor – if not a brilliant comedian. Our great comedies are about people who are trapped. Rigsby in Rising Damp, the Steptoes and Basil Fawlty were all trapped – Hancock was always trapped. They all had aspirations and you know they’re not going to make it. 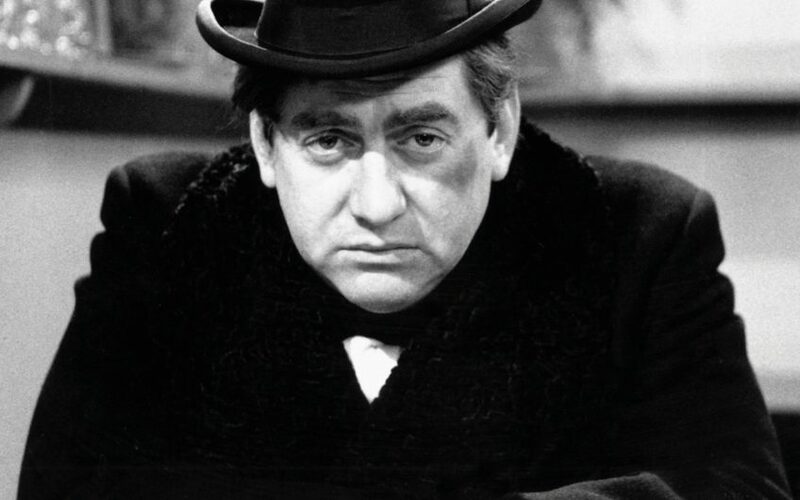 In his 1968 book London End J B Priestley had a self-destructive comedian character, based on Tony. Tony’s other epitaph is his own, in one of the suicide notes he wrote before his overdose: ‘Things just seemed to go too wrong too many times.